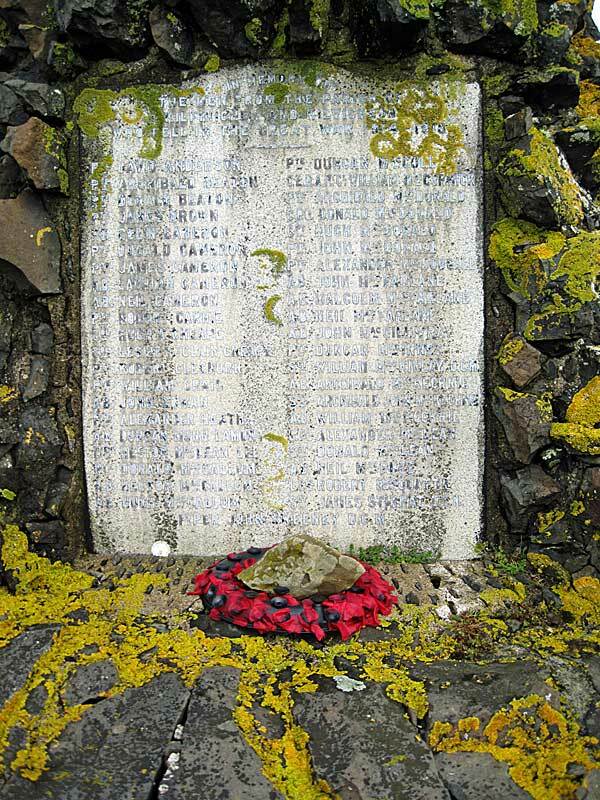 I have a large collection of War Memorial images, both in the UK and abroad and this section is due to be revamped with memorials listed in their respective regional locations etc* This page covers War Memorials in the City of Perth itself while another section covers memorials in the county of Perthshire etc (LINK*). 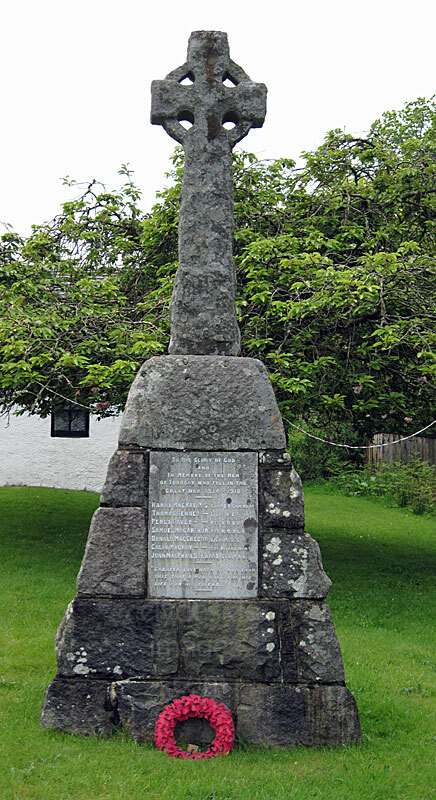 The Bunessan War Memorial, on the Ross of Mull, stands in a prominent position on a hillside behind the village primary school to the east of the village, on the north side of the B849. 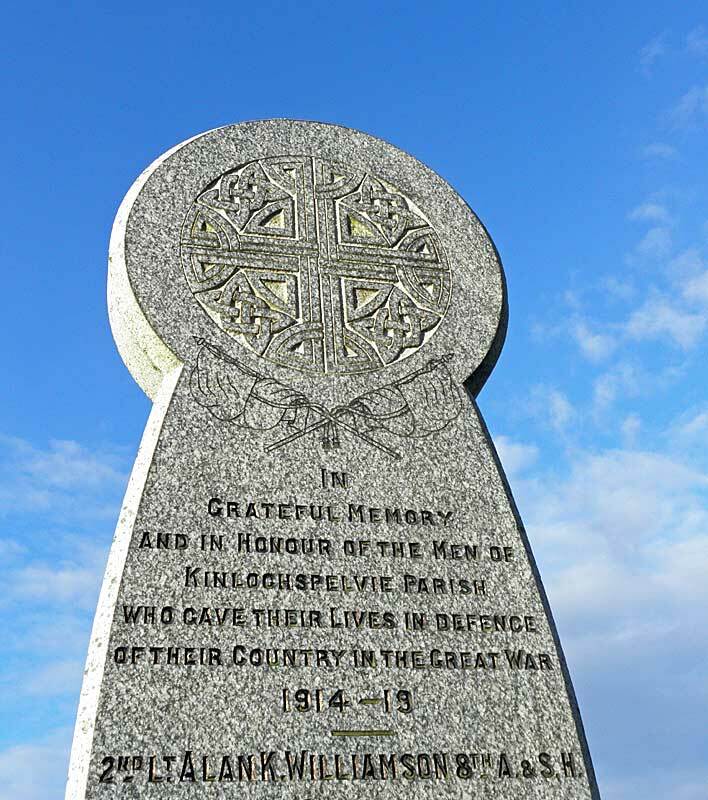 It commemorates the 41 residents of Bunessan, Kilfinichen and Kilvickeon who lost their lives serving their country during the Great War. 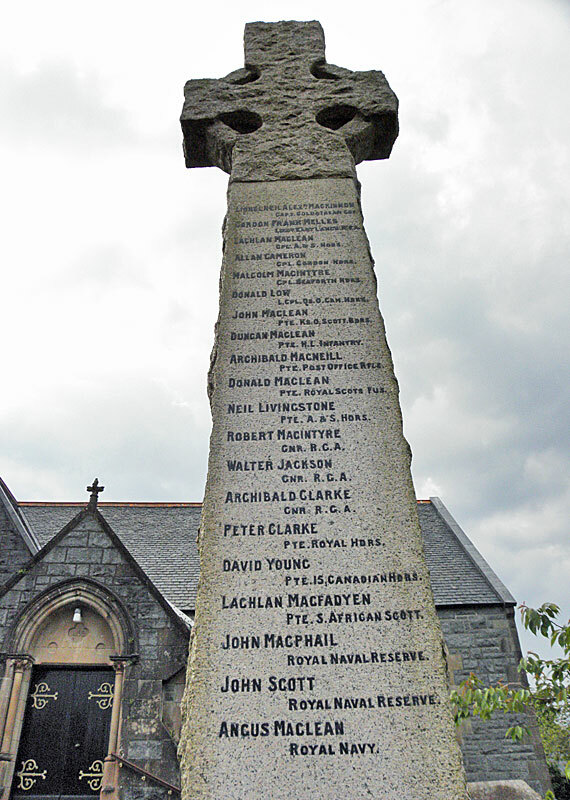 Five additional names were added following the end of the Second World War. 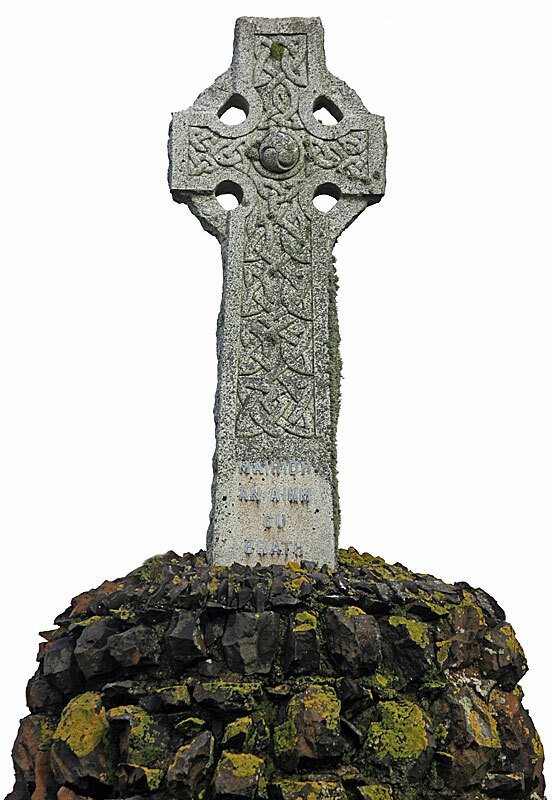 The memorial takes the form of a tall cairn of rough blocks of local stone, surmounted by a small grey granite Celtic cross with wheel-head and Celtic knots carved in relief on the face. 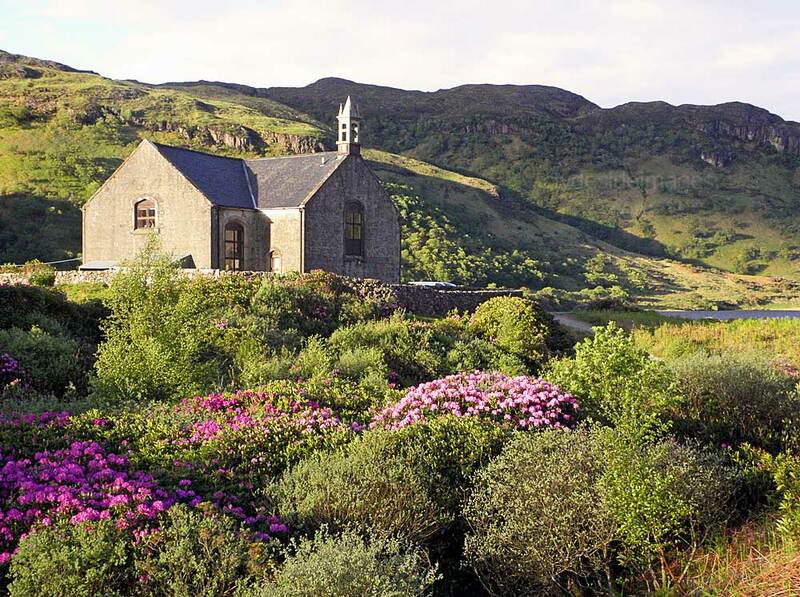 ​Creich Church stands in a picturesque location on the south side of the A849 overlooking Loch Poit-na-h-I, not far from the Iona ferry departure point at Fionnphort. 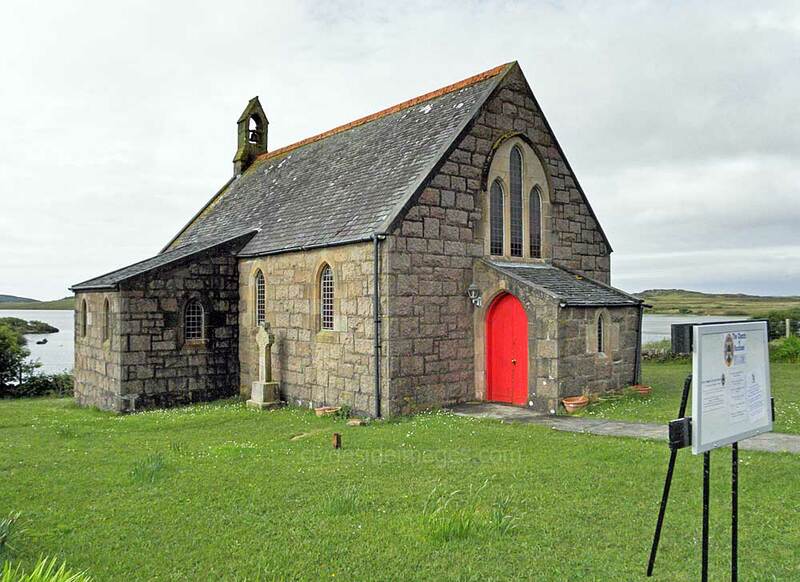 At the north end of the building is a small vestibule, its double doors facing east and on the east wall is a vestry with south facing doors overlooking the loch. 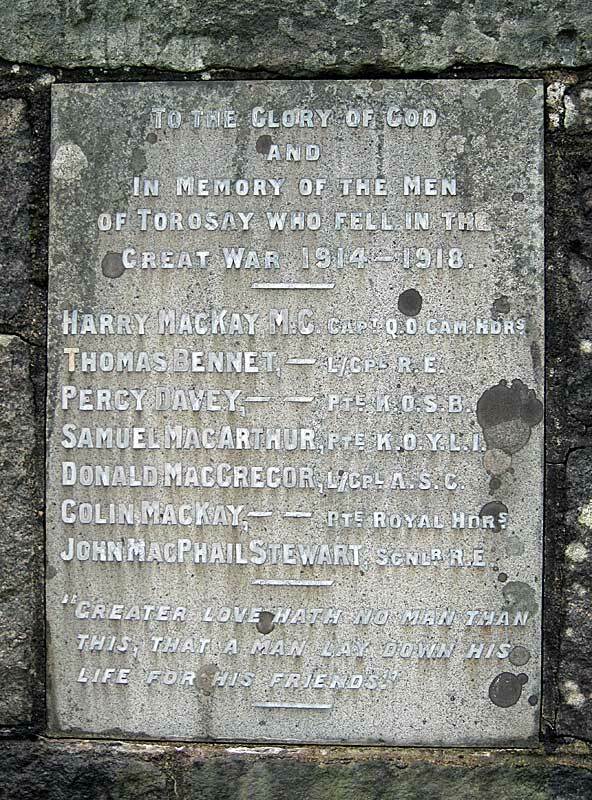 Within the vestibule is a memorial stone listing the names of the men from the Ross of Mull who gave their lives in the two World Wars; Fifteen from the Great War and one name from the Second World War. 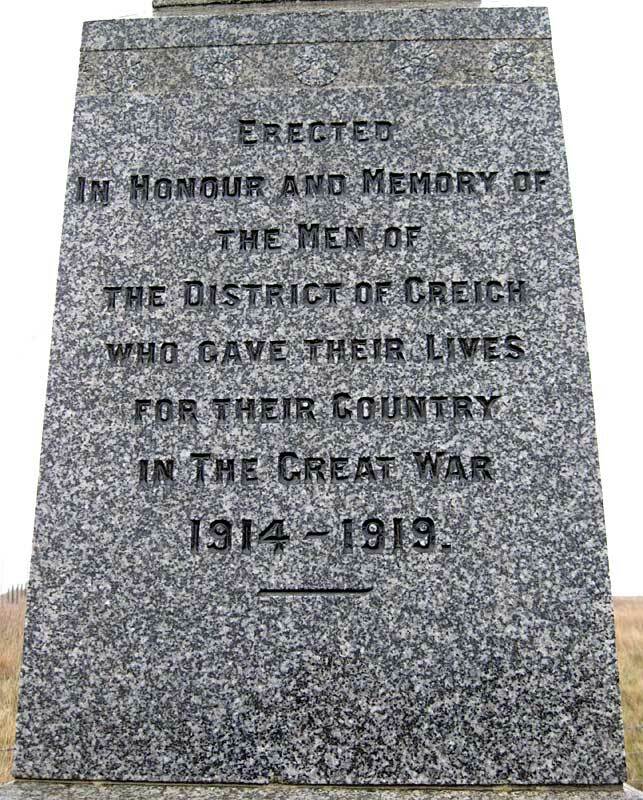 The District of Creich War Memorial, which I believe also covers Fionnphort`s War Dead, can be found near Creich Community Hall in the village, close to the junction with the A849. 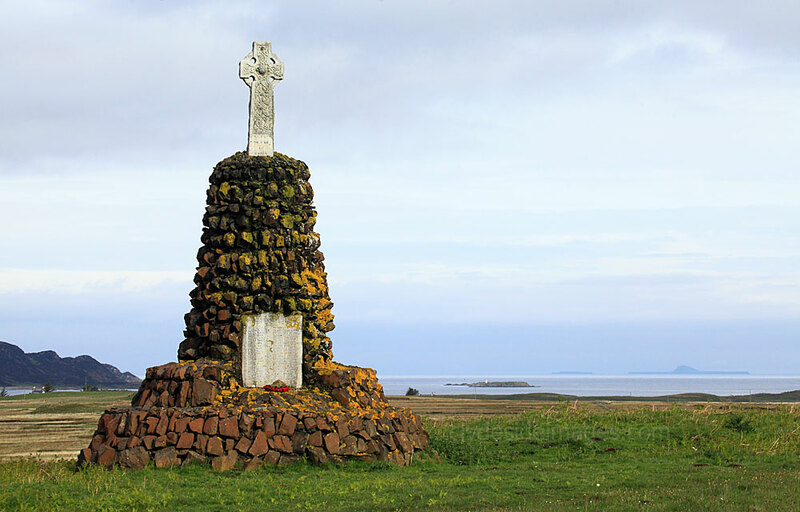 It stands within a small fenced area and lists the rank, unit or ship and date of death. Unsurprisingly, the majority of casualties were seamen. 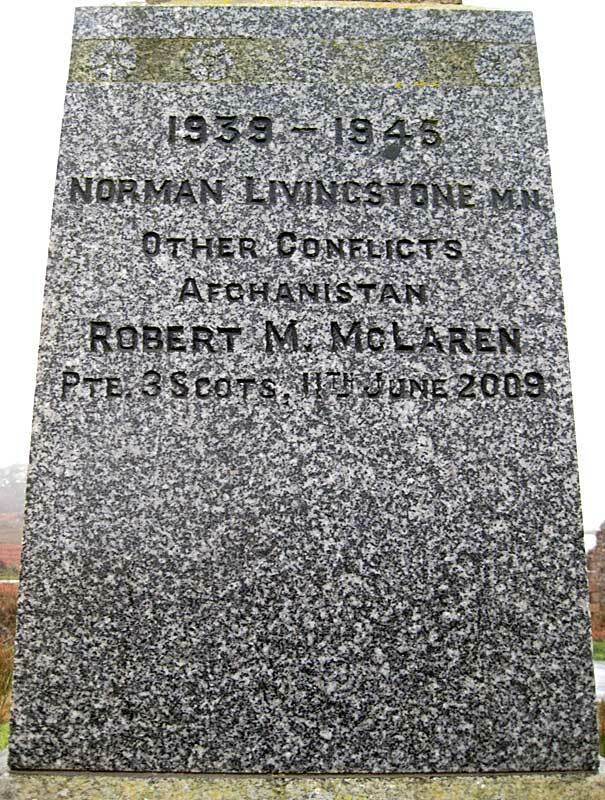 Norman Livingston, Merchant Navy was the sole WW2 casualty from the district and Robert M. McLaren, Pte. 3 Royal Scots, who died in Afghanistan in June 2009 is a reminder that remote communities such as this can still be affected by far flung conflicts. It was raining heavily when these shots of the memorial were taken with raindrops blurring the inscriptions on one of the sides. 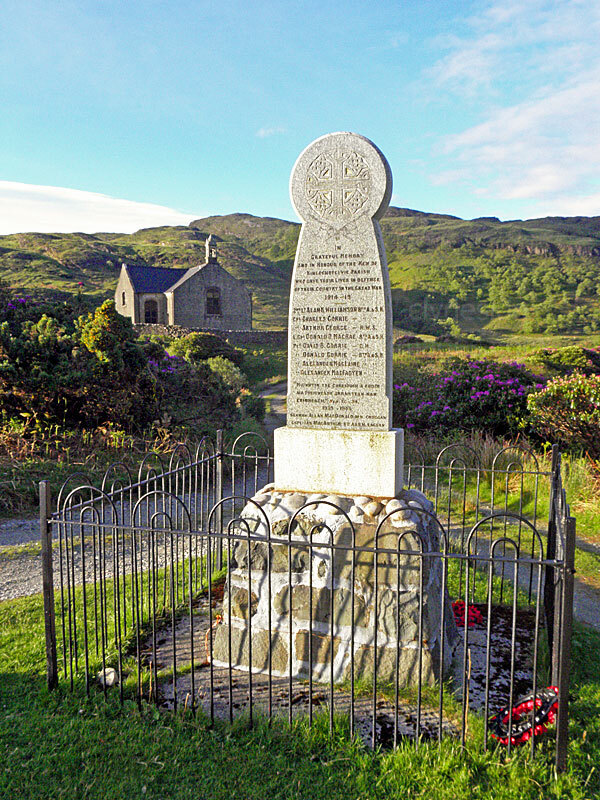 Rather than a traditional stone memorial, the community of Dervaig, at the north-west corner of the island, decided to honour its war dead on two tablets, which are displayed within Kilmore Parish Church. 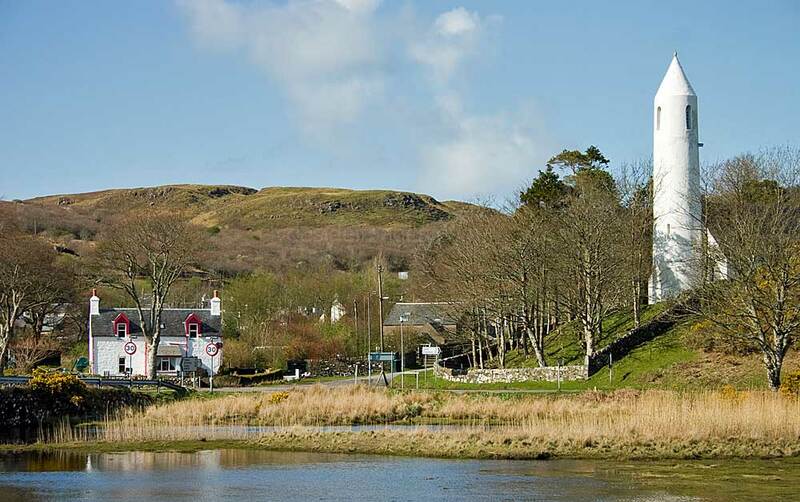 Work on the distinctive kirk with its pencil shaped steeple began in 1904. 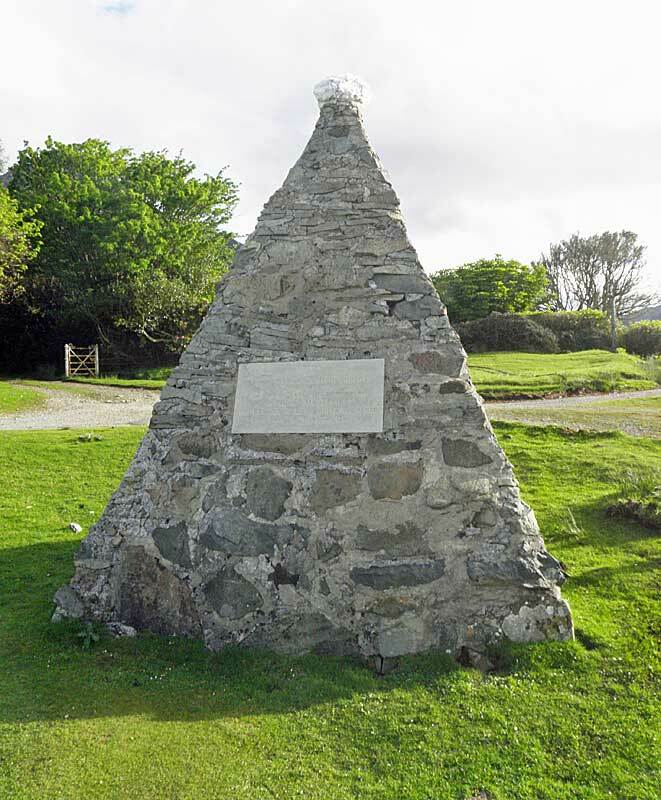 It was designed by Peter MacGregor Chalmers and it was complete by September of the following year. 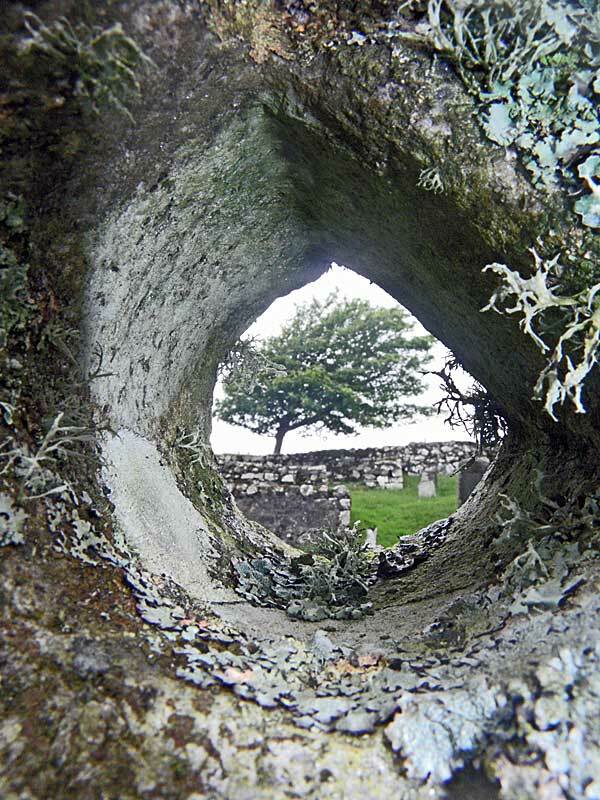 The architect based the tower on Irish watchtowers such Cashel, Enniskillen, and Clonmacnoise although in this case the tower formed part of the church and was not free-standing. 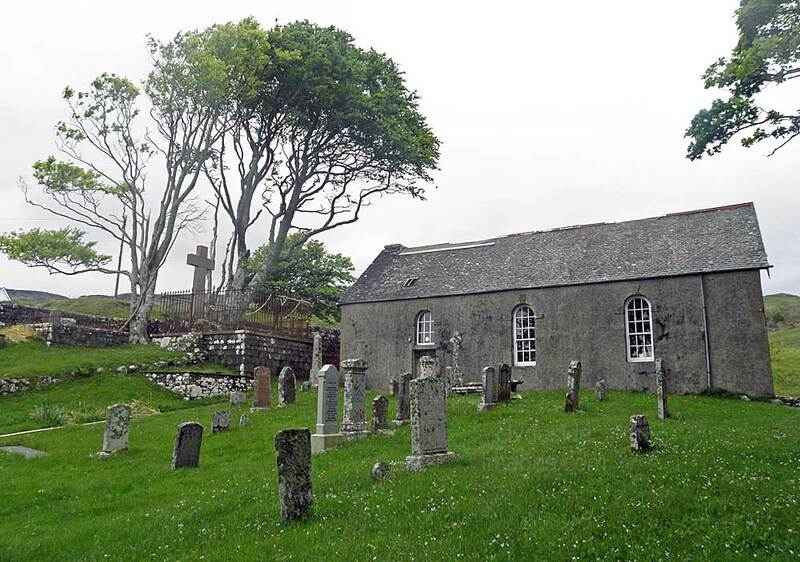 ​​The St Columba Episcopal Church and grave yard, at Drumlang are situated at Gruline beside the B8035 just west of the junction with the B8073. ​Greenhill-Gardyne (1831-1923) was helped financially by Captain Parr of Killiechronan and together they bore the cost of the construction. 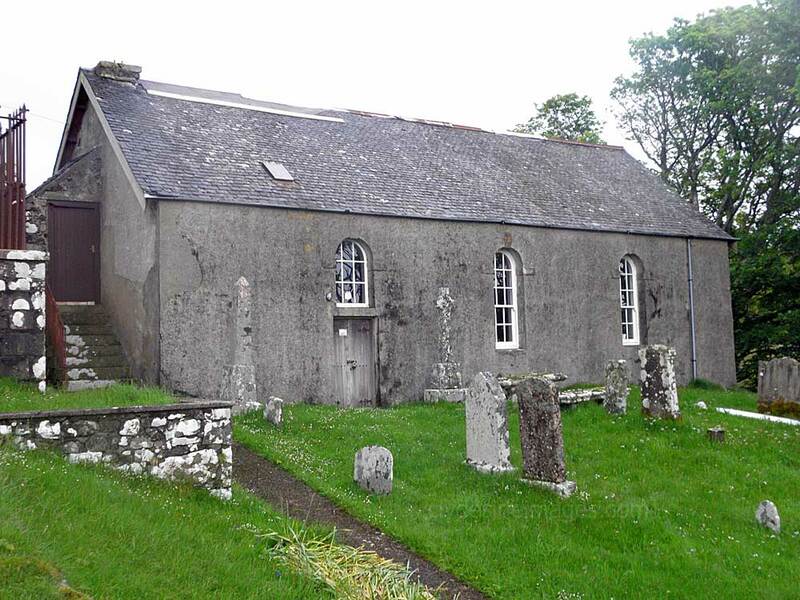 The first service didn`t take place until June of the the following year when twenty-six people attended the morning service, which was in English, and 47 attended the evening service held in Gaelic. 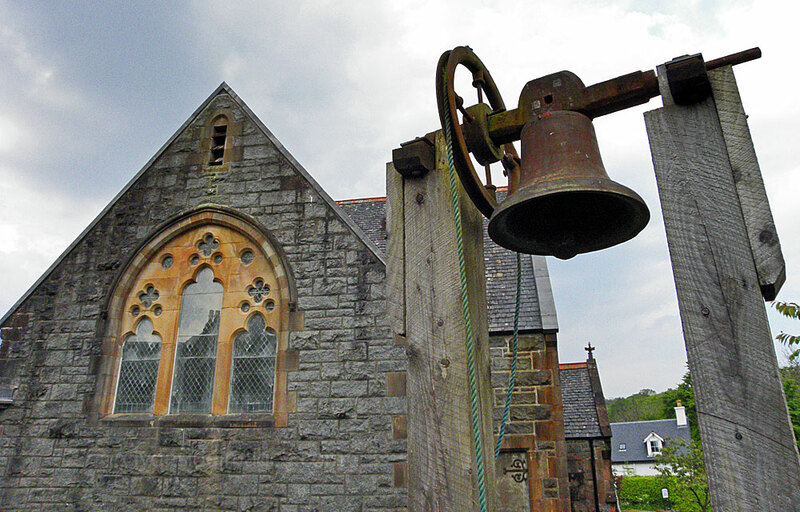 Finally, on 4th July 1875, the church was consecrated by Bishop George Richard Mackarness making it the first church on Mull to be consecrated for several centuries. It has never had a permanent, island-based minister with services usually led by visiting chaplains in summer and lay preachers from the community in winter. 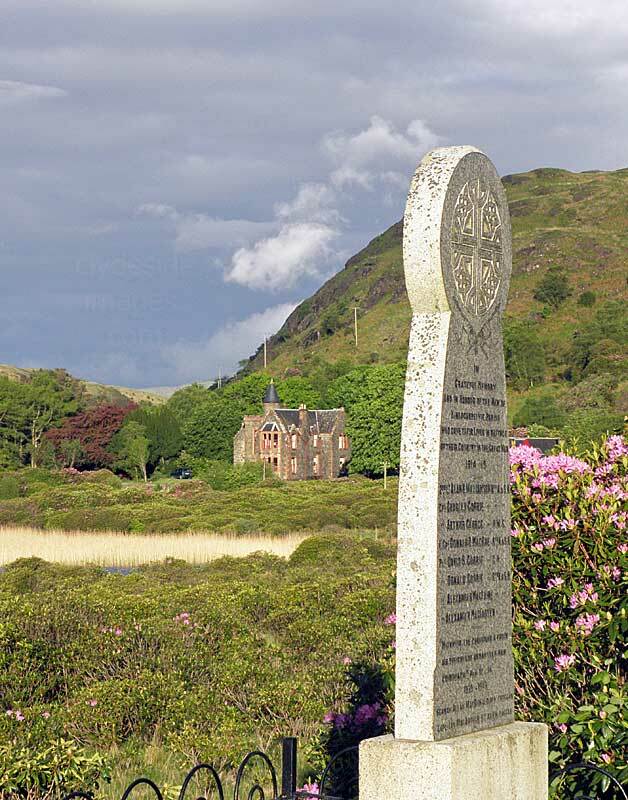 ​​Also known as the Loch Buie War Memorial, this monument to the men of Kinlochspelvie Parish occupies what must be one of the most picturesque locations on the island, especially when viewed in the late spring or early summer sunshine when the massed ranks of Rhododendrons are in bloom. 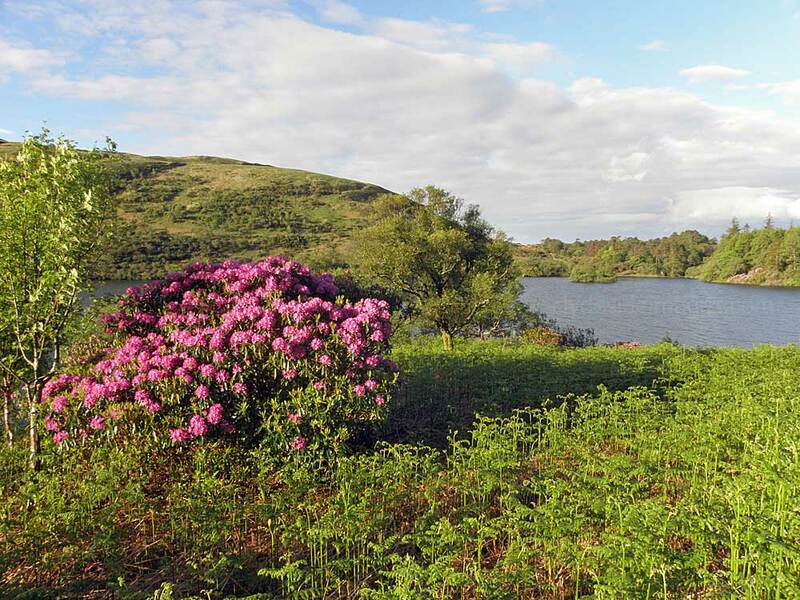 The roadside and lower slopes of the adjacent hills are covered in identical pink flowers and the area is alive with birdsong. 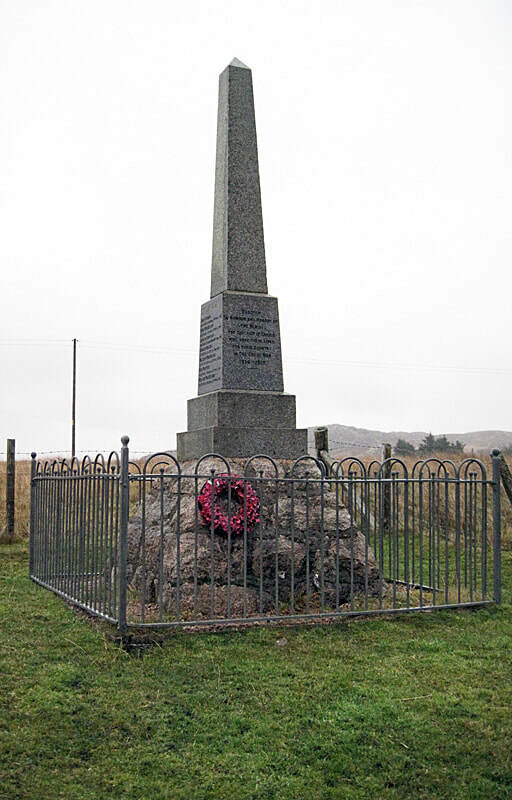 ​The memorial, which stands in front of Kinlochspelvie Parish Church, lists eight men from local settlements who lost their life in the Great War and two from WW2. 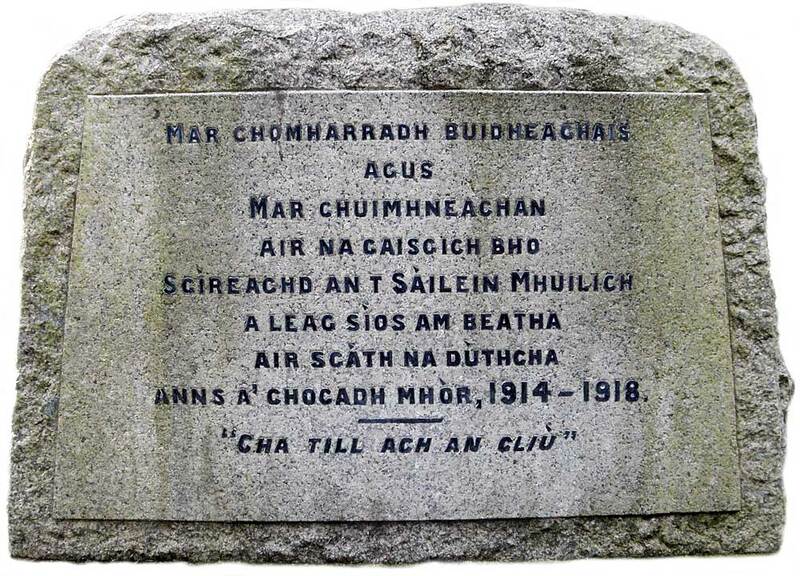 The Gaelic inscription on the front is a biblical quotation which translates as "Those who through Faith turned to flight the armies of the foreigners." `Heb.XI.-34. 1939-1945`. 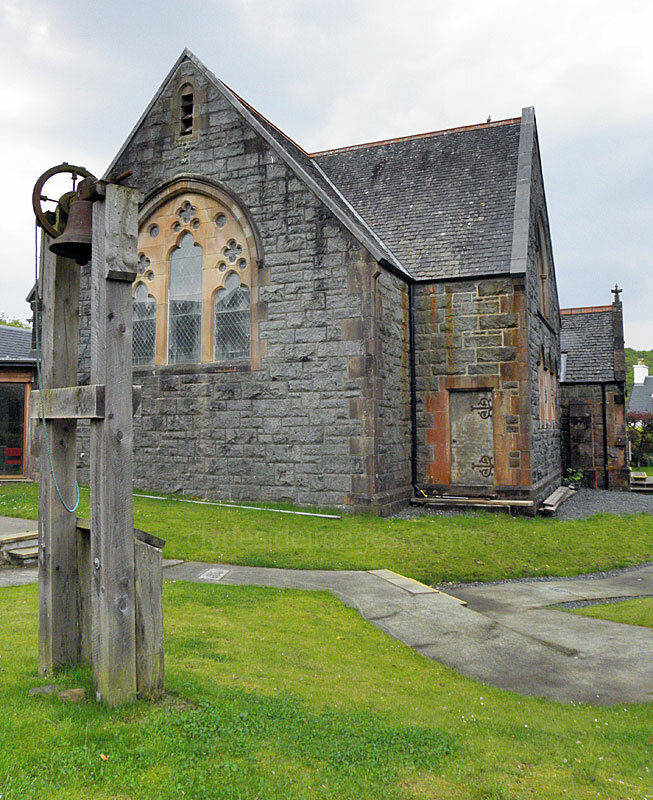 The kirk, which dates from 1828, is one of several churches on the island built to a standard 'Parliamentary' design produced by Thomas Telford. 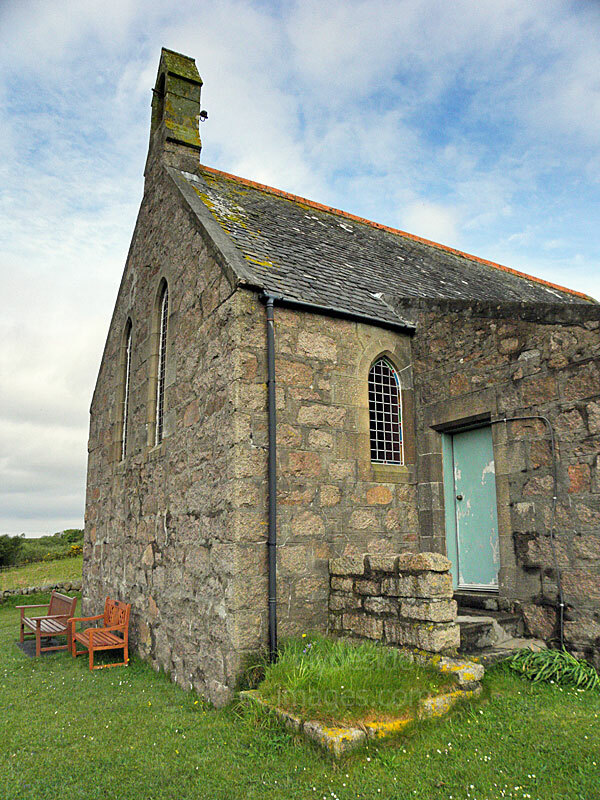 It is now privately owned and has been converted for use as a holiday let. The fine mansion of Craig Ben Lodge lies to the west. ​Lionel Neil Alexander MacKinnon, Capt., Coldstream Gds. Gordon Frank Melles, Lieut., East Lancs. R. F. A.
Lachlan MacLean, Cpl., A. & S. Hdrs. Allan Cameron, Cpl., Gordon Hdrs. Malcolm MacIntyre, Cpl., Seaforth Hdrs. Donald Low, L/Cpl., Qs. o. Cam. Hdrs. John MacLean, Pte., Ks. o. Scott. Hdrs. 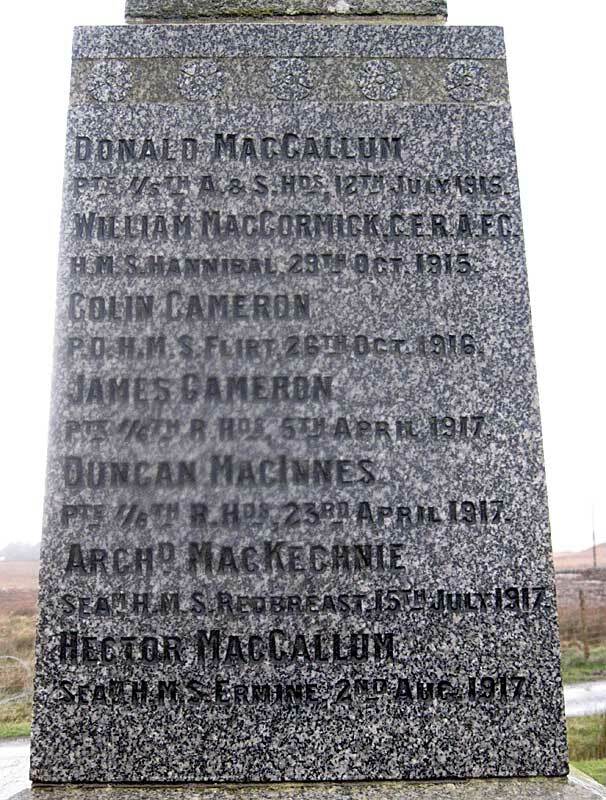 Archibald MacNeill, Pte., Post Office Rfls. Donald MacLean, Pte., Royal Scots. Fus. Robert MacIntyre, Gnr., R. G. A.
Walter Jackson, Gnr., R. G. A.
Archibald Clarke, Gnr., R. G. A.
Peter Clarke, Pte., Royal Hdrs. David Young, Pte., 15 Canadian Hdrs. 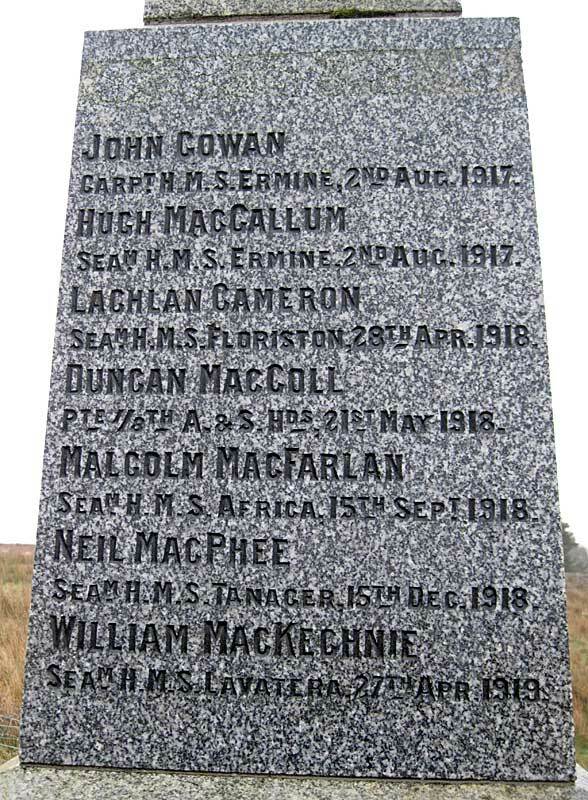 Lachlan MacFadyen, Pte., S. African Scott. 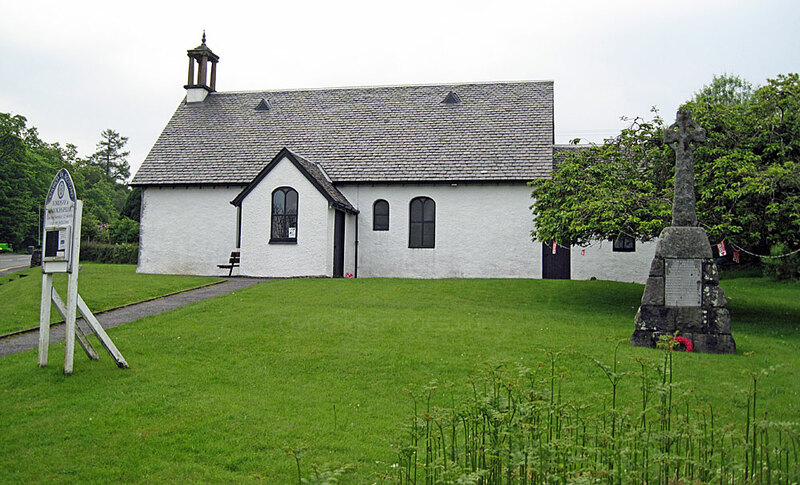 In all, there have been four churches on the site where the present Church of Scotland in Salen now stands. Over 300 years have passed since the first small structure was built and this was replaced in 1777 by a slightly bigger building. 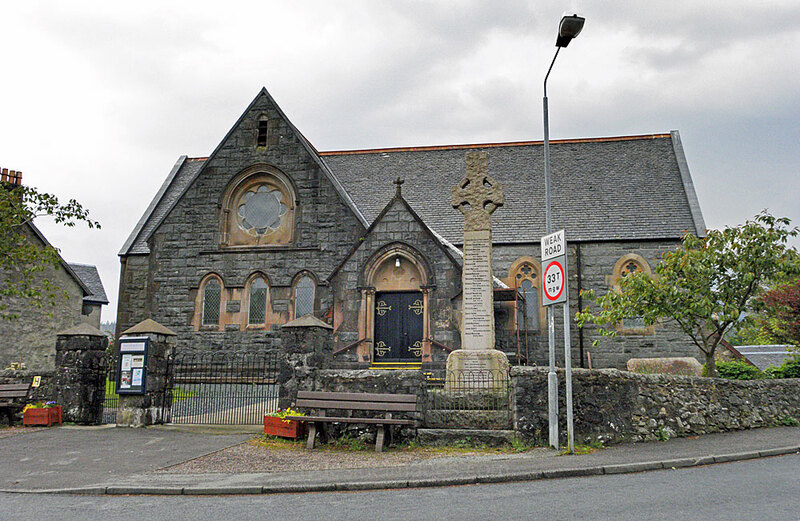 As the village expanded during the 19th century the next, even larger replacement in 1824 remained in use until 1899 when the current church was built. 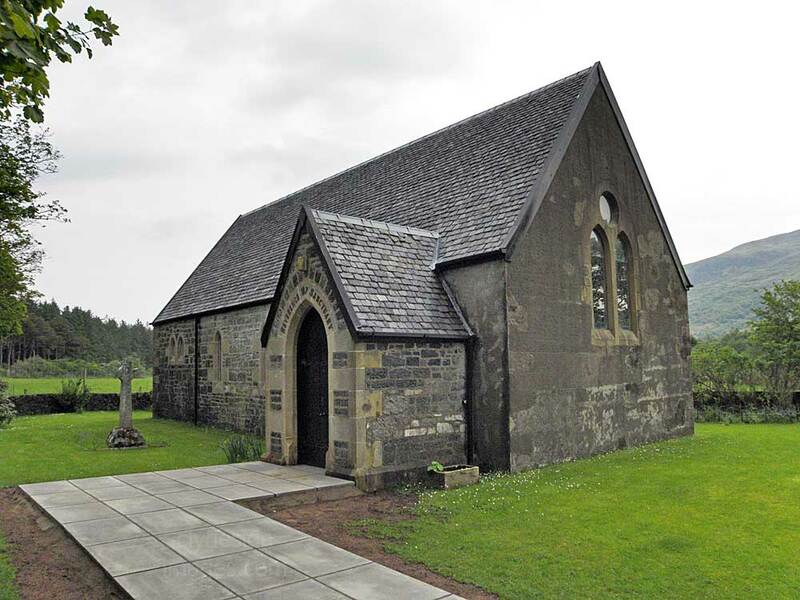 ​There are no WW1 or WW2 memorials at this simple nave church which was built in 1755 to serve the parish of Kilninian, however, a cairn and a plaque on the kirkyard gate refer to military personnel. The vestry reputedly contains ancient burial stones from the 14th-16th centuries including an effigy of a man in armour carrying a claymore but the building was locked when I called. 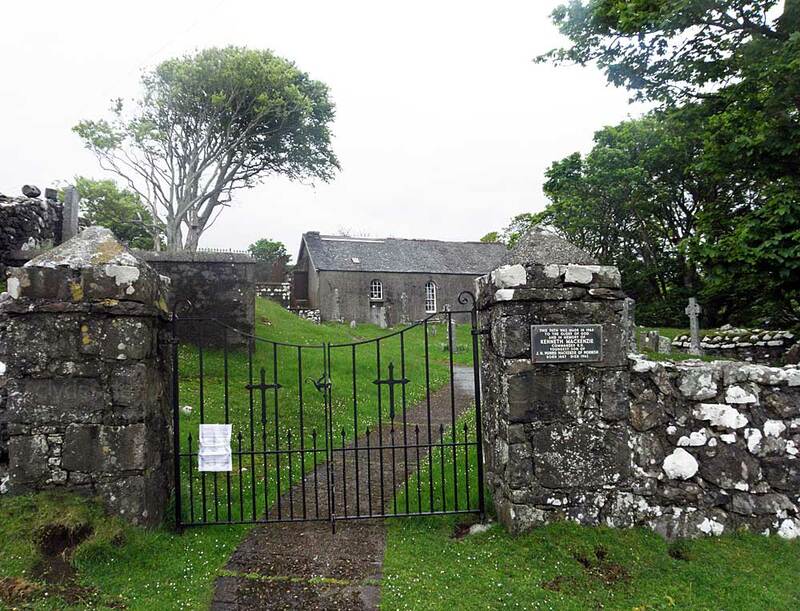 This plaque on the right-hand gatepost reads `This Path was made in 1964 to the Glory of God and in Memory of Kenneth MacKenzie, Commander R.N. youngest son of J.H. 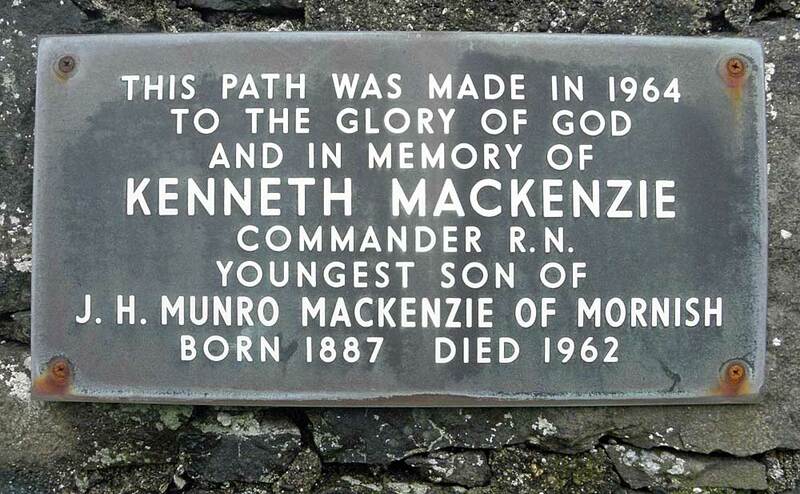 Munro Mackenzie of Mornish (1887-1962)`. 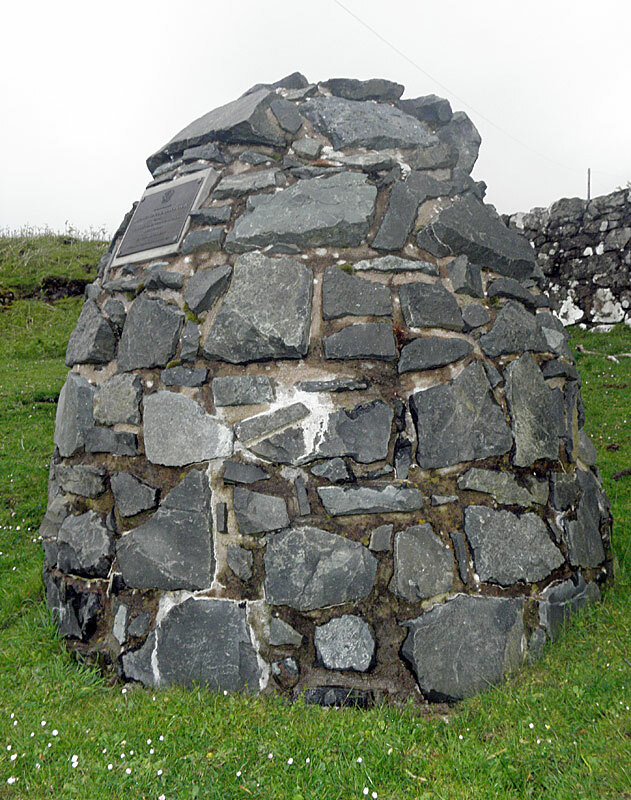 This cairn, erected by the Clan MacLean Heritage Trust, commemorates Brigadier General Allan McLean, born at Torloisk(1725-1798). `The Hero of Quebec and Saviour of Canada`. 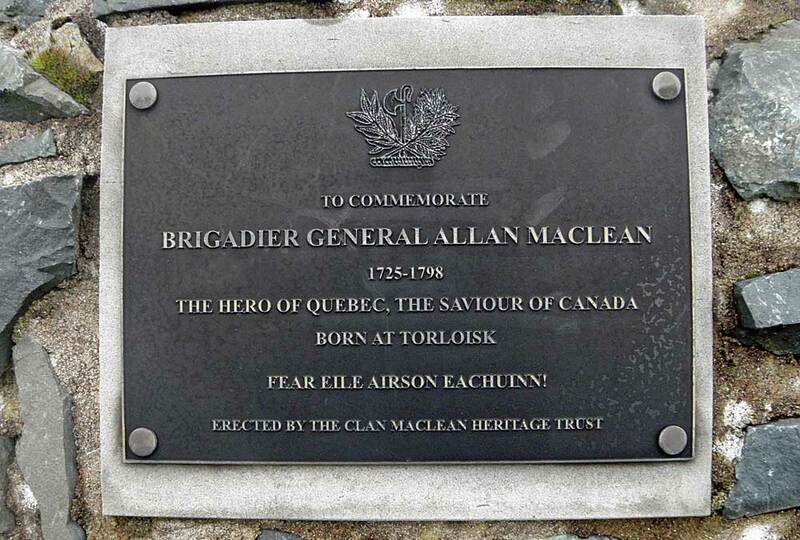 MacLean was a Jacobite who became a General in the British Army. He led the 84th Regiment of Foot (Royal Highland Emigrants) in the defence of Quebec and if it hadn`t been for the actions of these troops, Canada would have become a part of the United States of America. 'Greater Love Hath No Man Than This; That A Man Lay Down His Life For His Friends'. 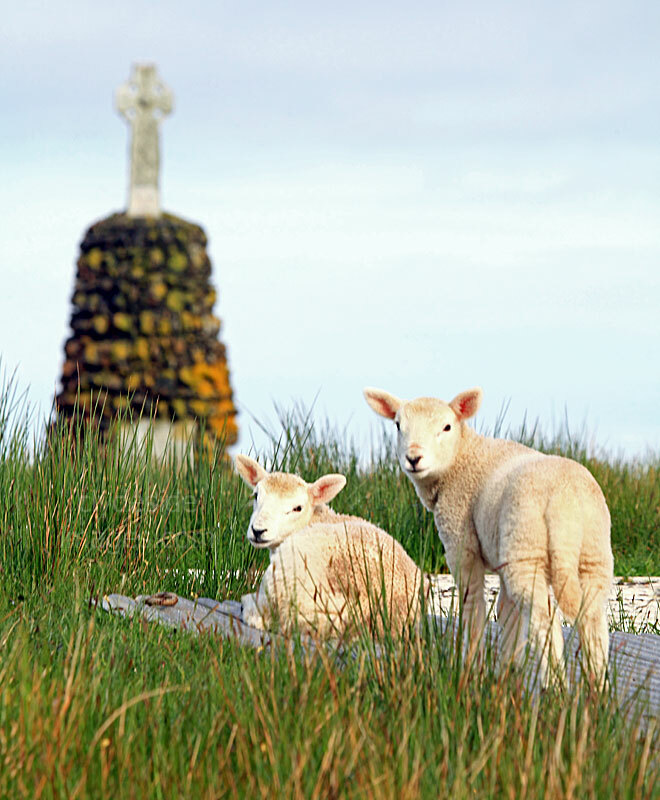 There are also two non-military memorial cairns at Lochbuie, the first being the Victoria Monument (above left) which stands at the west end of Loch Uisg on the road in. 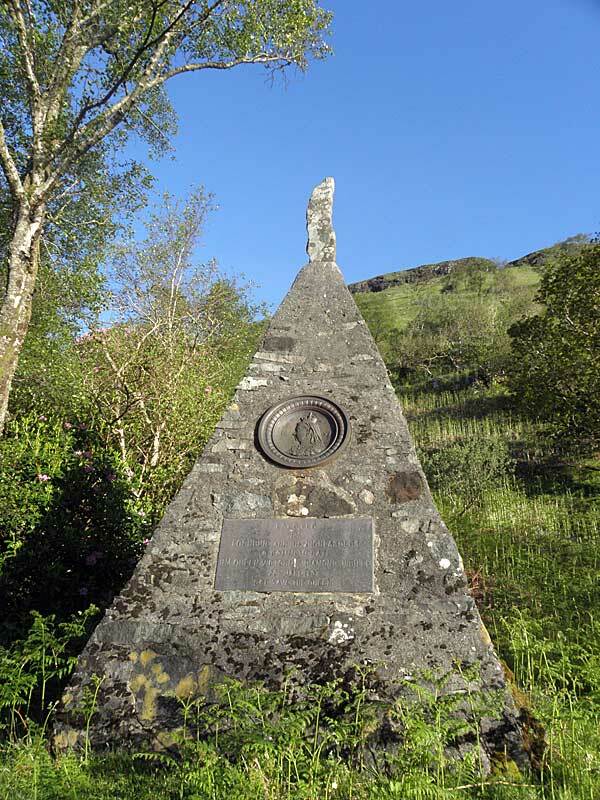 Its inscription reads: "Erected by Lochbuie and his Highlanders to Commemorate Queen Victoria's Diamond Jubilee. 22nd June 1897." 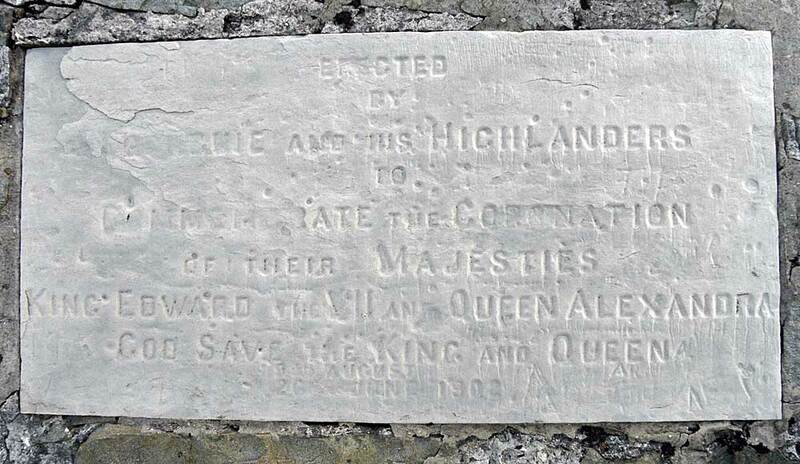 The other, beside the head of Loch Buie itself, was erected to commemorate the Coronation of King Edward VII and Queen Alexandra in 1902. The bay at the road end where the Coronation cairn stands is a superb spot. 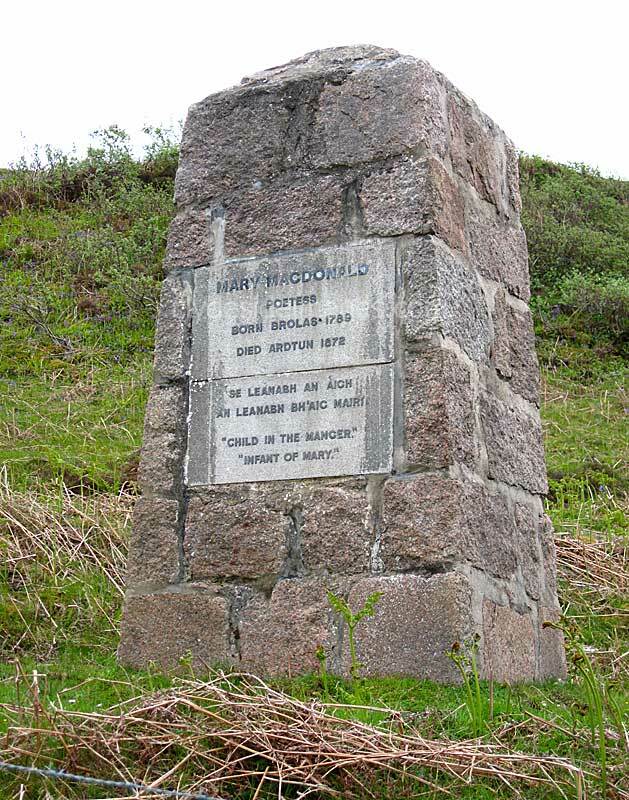 This cairn at Strathcoil commemorates Dugald MacPhail (1818-1887), a Gaelic songwriter, poet and author, best known for the song An t-Eilean Muileach (The Isle of Mull), now known as 'Mull's National Anthem'. 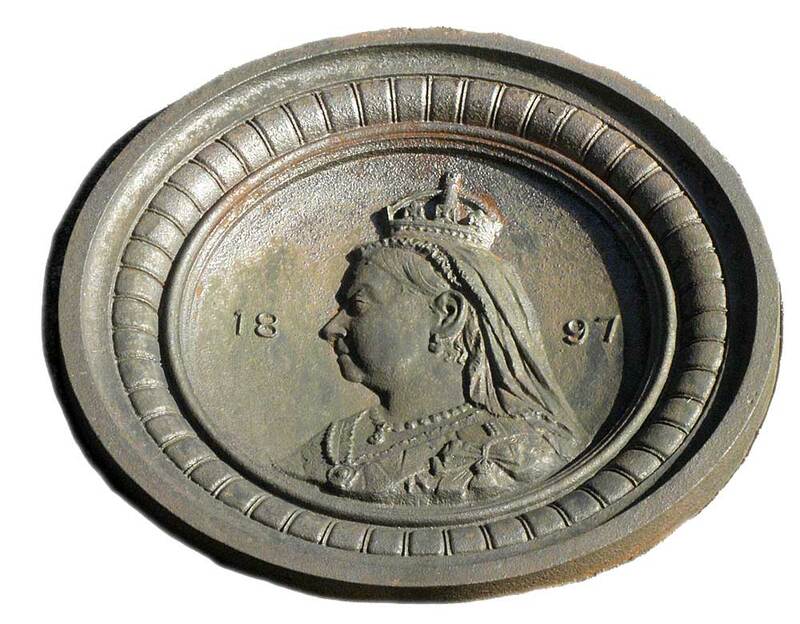 He was architect and clerk of works to the Duke of Westminster. 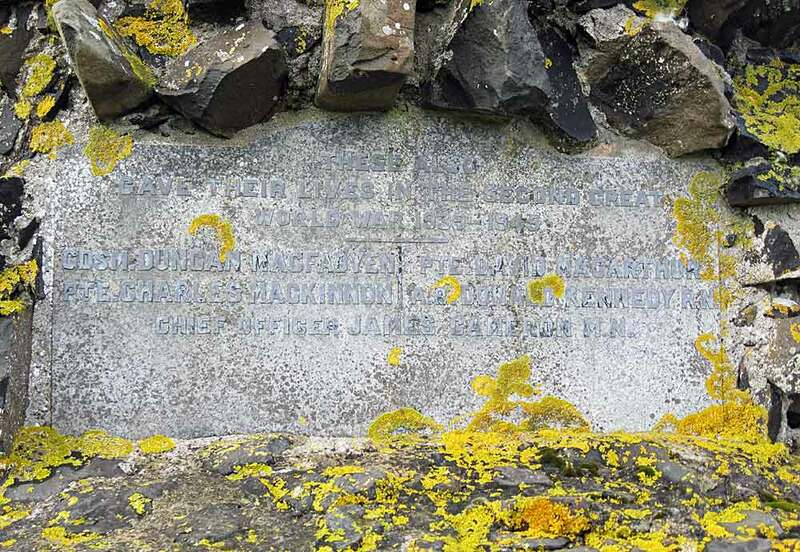 Later he moved to Edinburgh, where he wrote the song An t-sobhrach Mhuileach (The Mull Primrose), and in 1859 was awarded a prize by the Edinburgh Celtic Society for an essay on the Highland Clearances. He also wrote the autobiographical Callum a' Ghlinne (Callum of the Glen). Anyone stopping for a photograph here should be aware that they`re likely to be accosted by several grumpy Peacocks from a nearby cottage!